What better way to turn a fresh page in the new book of 2016 than with a full body reset. Derek and I just finished a three day vegan cold pressed juice cleanse from Beau's Juicery & Co. — a local business here in Gloucester. This meant for each of the three days, we stayed on a schedule of drinking the above six liquids at specific times throughout the day with water. Nothing else. Being that this was our first time ever doing something like this, it was not a walk in the park by any means. However, in the end we were highly pleased with the benefits and consider the experience so worth it. With our wedding about seven months away and a serious goal to treat our bodies better this year (and so on), this was the perfect way to begin. 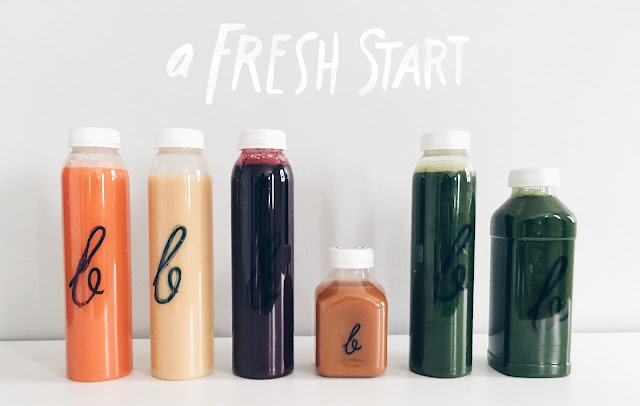 If you're thinking about doing a cleanse anytime soon, below I'm sharing with you my overall takeaway from the experience and how to complete a cleanse successfully. And hey if you do, keep it local and order from Beau's! 1. Mentally preparing at least a week in advance for what you're about to commit to is key. I'm not sure how many people can wake up in the morning and just be totally ready to not eat for three days. I know I am not one of them. When we initially decided to do this, we discussed what we were hoping to get out of it and why it was important for us. Keeping this in mind prior and during the cleanse helped keep us on track and motivated. Also, knowing ahead of time the date that we were starting allowed us to be in the right mindset come the morning of day one. 2. Eat an almond or seven if you are having a moment. It's fine. One of the biggest misconceptions I had about doing a cleanse was that I was going to be starving the entire time. To my surprise, I was not. In fact, I found myself rather refreshingly full after each juice — especially those that you consume during lunch and late afternoon when hunger can seriously strike and energy can be low. However, I absolutely had a moment each day where I needed a little something to fill the gap and a small handful of almonds did just the trick. It's "allowed", if you will. So go for it, especially if it means keeping you on track. 3. The benefits are two fold: both mental and physical. Not only did this cleanse have an obvious affect on the state of our bodies, which is great, but the mental impact it had is where I'm really blown away. Physically, our bodies were reset with an intense three days worth of nothing but pure nutrient enrichment and a full flush of toxins. I also lost seven pounds, so there's that. Mentally, and I know I can speak for both Derek and I here, we feel like we can take on anything within our diet and exercise goals after this. Simply because this was such a commitment for us financially, mentally and physically requiring a ton of will power for 72 hours, that a 30 minute workout or eating a healthy meal sound like a pleasure rather than a sacrifice in comparison. Reverse psychology at it's finest? Either way, this cleanse did many positive wonders for us leaving us feeling totally refreshed and ready to continue a lifestyle that includes much more movement and nourishment. Next week I'll be sharing our full set of 2016 goals. Yes, that bring us to the middle of January but I think goals this big require more than just New Years Eve to distinguish. Keep an eye out!